Anti-bacterial, mildly antiseptic; an excellent "deodorant". "This is the second time I have ordered from ZooScape and I have been very pleased with the service they provided. A bit skeptical, our retailer decided to try it for himself. Freshly showered with carbolic soap, he attended his kid's evening baseball game. He noticed everyone in the stands was swatting continuously throughout the game. He watched mosquitoes land on him then literally leap off without biting. One of our customers in northern Ontario stocks up on carbolic soap every spring. "It's one of the first things the tree planters buy." They are out in the deep woods from dawn to dusk. They swear that it helps keep the bugs from biting. Worm picking is done at night, which is peak mosquito time. 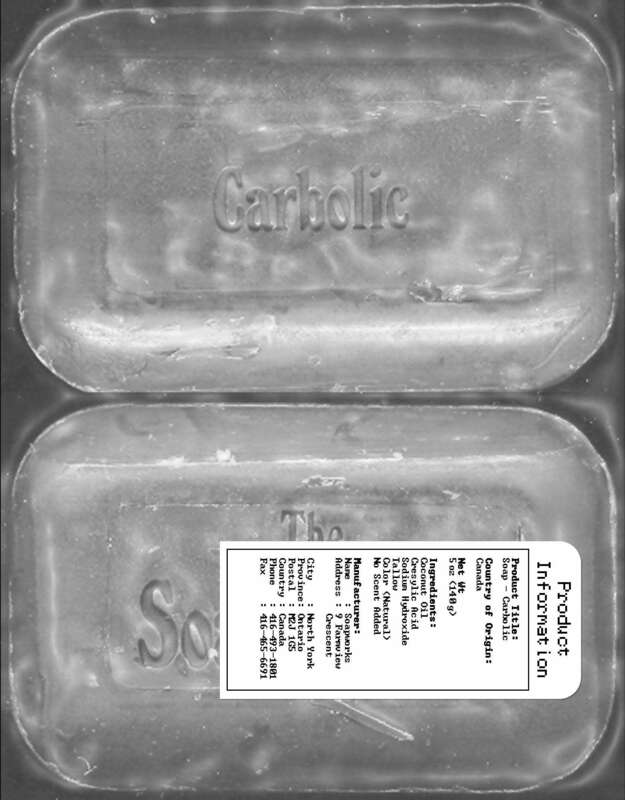 For many years, one of our distributors has been shipping cases of carbolic soap to a pickling company in the prairies. We have no scientific evidence to support why carbolic soap helps to keep mosquitoes from biting; we think it cleanses away most of your natural scent, which attracts mosquitoes, and replaces it with that medicine-like carbolic fragrance. The only evidence that it works is contained in the many stories and testimonials from our retailers and their customers. Thereza works at a Health and Bulk Food store in Thunder Bay, Ontario. She can always tell when the Girl Guide and Brownie groups are summer camping. Their parents all come into her store and buy carbolic soap. "Every summer they come in and clean us out!" We were trying to think of one of the worst jobs for bugs. Aside from being an entomologist, we heard about this one. It was a summer job. The son of one of our retailers had a summer position working for Ontario Hydro. He was part of a crew clearing bush for electric power lines. Talk about being bug magnets. His mother included carbolic soap in his kit with instructions to "wash head to toe with it everyday". Later he thanked his mom for the homespun advice. He explained that mosquitoes bit him. "But", he said, "you should have seen what the guys looked like who didn`t use carbolic." Can you use carbolic soap on dogs? This is the second time I have ordered from ZooScape and I have been very pleased with the service they provided. I like the Carbolic soap as I find it really does keep the mosquitos away from me. It has significantly cut down on the amount of bug bites I've had this year. Carbolic Soap is excellent. I've been using it since I was a baby and it clears up all kinds of skin rashes and even helps with feminine problems.....you'll get what I mean girls if you suffer from itching or burning 'down there'. Its great for sensitive skin. Would recommend. Shame its in USA tho as we can't get it in UK anymore! Your carbolic soap rates five stars with me. I'd heard of its legendary cleansing and deodorizing properties with the old Lifebuoy soap, and wanted to try it for myself. But Lifebuoy's very hard to find anymore. So I was delighted to find your carbolic soap available at my local health food store. It is refreshing, invigorating, and I enjoy that distinctive fragrance. (My granddaughter likes the bright color, too!) I'll be sure to go back for more. This is the best soap I have found in my many years of searching for quality without carcinogenic preservatives...if you can't find it in yur favorite health store, get it online!! Hi from Australia! We cannot get this wonderful product here. Zooscape were fantastic: quick processing and delivery! And the quality? First rate. Thanks so much. Also Recommended: The Coal Tar soap is great, too. In Aust, only the 'artificial' soap is now available - smells the same, but full of chemicals. This is the real deal. The soap is a great nostalgic product. By just chance in looking and reading I discovered carbolic soap. I decided to get it a try. I searched several places and found Zooscape to be the cheapest. After using it for a few weeks and smelling the scent, I couldn't quite place where I remembered it. Then one day I discovered it. I used it when growing up. We bought it in stores by the name of Lifebuoy. I love to smell it better now than when I was young.